Start the jungle / village trail to Thalkote Wewa. [Tank] This is about 5.2km long and takes about 3 hours. This trail is going through few jungle patches / chaina cultivations, paddy fields. The terrain is flat and easy walking. 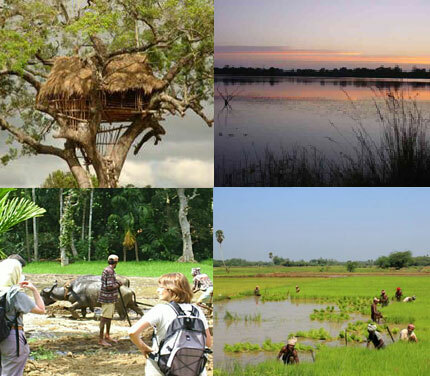 You will be able to observe the real way of life of the villagers in this part of the country. Arrival at Sigiriya [Near the Hotel Sigiriya ] around 8.30am . You will meet Eco Team representative at there. This ancient tank is located having the ancient Sigriya Rock Fortress and the Pidurangala Monastery Rock as the back drop. It provides a life line of water to many villagers in the area to cultivate their crops. Paddy / Onions and other varieties of vegetables are grown providing water from this tank. You can see many Tree houses, a semi permanent tall structures constructed by wood where farmers spend the night time. They take terns to be up during the night to have an eye on their crops which are easy edible targets for wild elephants and other animals. Keeping the "camp fire" alive is also an important duty! Chaina Cultivation [slash & burn farming]This a very primitive agricultural method where farmers slash and burn jungle patches for cultivation of short term crops. They mainly depend on rain water and there will not be any major field preparations. Farmers usually rotate between 2 to 3 land plots. A bullock cart is a two-wheeled vehicle pulled by Buffalo. It is a means of transportation used since ancient times in many parts of the world. They are still used today where modern vehicles are too expensive or the infrastructure does not favor them. Water & Snacks on the way. Any additional beverage or food, which would be ordered extra. Light clothes Trekking shoes/boots are recommended for trekking.